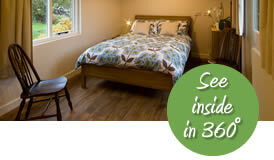 Welcome to our spacious, comfortable self catering accommodation on the open New Forest at East Boldre, near Beaulieu. Sleeping 2 – 6 guests for full weeks, up to 8 for short breaks, Bartley Barn welcomes couples, families and family groups, with or without your pet dog/s. Bartley Barn enjoys a fantastic location right on the forest, with far reaching views over the open heathland to the west. It is within a couple of minutes' stroll of picturesque Hatchet Pond and its spectacular, much photographed sunsets. It's a perfect base for miles of off road walking, running, cycling and horse riding in the New Forest – all literally from your front gate. Our self contained, self catering accommodation with its own dog proof, sunny terrace overlooking our small paddock, is a modern barn style building which also contains our garage. We live full time in Bartley House next door, so we’re normally here if you need us - but we won’t disturb you if you don't! The flexible layout of the Barn enables it to provide a cosy forest retreat for a couple, just as easily as enough beds and living space for up to 8 for a short break. For couples there’s a choice between the convenient downstairs double bedroom which overlooks our patio and garden, or the more private upstairs bedroom area with restricted headroom which is reached via a spiral staircase. For families and friends there is a total of 6 beds upstairs as well as the downstairs bedroom – perfect for mixed generation family groups. There’s even a sofa bed in the living room for overflow. Do take a look at our virtual tour which shows you exactly what it’s like, far better than words can describe. We do welcome dog owners with (normally up to 2) well behaved dogs – our forest is doggy heaven so it would be mean not to! However we are also very mindful of our guests without pets and the accommodation is cleaned from top to toe at changeover. Our small paddock with field shelter can be booked by arrangement if you wish to bring your pet horses or ponies – the paddock is right next to your private terrace so they can even watch you eating breakfast! East Boldre is a traditional forest village which unlike some of the better known New Forest towns changes little between low and high season. We are proud to boast a well stocked stores & post office and a friendly garage within 5 minutes walk, plus a little further on the Turfcutter’s Arms which serves plentiful good food and welcomes dogs. There is also a well equipped children’s playground in a picturesque forest setting, a very pleasant walk across the forest from Bartley Barn. East Boldre enjoys a very convenient location in the south east of the New Forest between Beaulieu (with its famous Motor Museum), Brockenhurst and Lymington, with easy road access to the major towns of Southampton and Bournemouth. Bartley Barn is a great base to explore the New Forest - do come and visit!